Clement Richard Attlee, 1st Earl Attlee, KG, OM, CH, PC (January 3, 1883 – October 8, 1967) was Prime Minister of the United Kingdom of Great Britain and Northern Ireland from 1945 to 1951, having served under the first Labour Prime Minister, Ramsay MacDonald in the early 1920s, and as Churchill's deputy during World War II. The Labour Party under Attlee won a landslide election victory over Winston Churchill immediately after Churchill had led Britain through World War II. He was the first Labour Prime Minister to serve a full Parliamentary term and the first to have a majority in Parliament. He served longer as the leader of the Labour Party than anyone else in British history. Churchill himself expected to be returned to power after the war. Attlee lacked Churchill's charisma, but the nation was tired and ready for a change. The government he led put in place the post-war consensus, based upon the assumption that full employment would be maintained by Keynesian policies, and that a greatly enlarged system of social services would be created—aspirations that had been outlined in the wartime Beveridge Report. Within this context, his government undertook the nationalization of major industries and public utilities as well as the creation of the National Health Service. After initial Conservative opposition, this settlement, generally known as the post-war consensus, was by and large accepted by all parties until Margaret Thatcher became leader of the Conservative Party in the 1970s. His government also presided over the decolonization of a large part of the British Empire, in which what are now India, Myanmar, Sri Lanka, and Pakistan obtained independence. Had Churchill and not Attlee won the election, the decolonization program that started almost immediately with India's independence may very well have been delayed. In 2004, he was voted as the most effective British prime minister of the twentieth century in a poll of professors organized by MORI. His greatest achievement, surpassing many of these, was, perhaps, the establishment of a political and economic consensus about the governance of Britain that all parties subscribed to for three decades, fixing the arena of political discourse until the later 1970s. This consensus revolved around recognition of government responsibility for providing high standards of education and health care paid for via the tax and national insurance system, together with state pensions and benefits for the unemployed with an emphasis on a self-regulating commercial sector based on capital investment and economic freedom. John Maynard Keynes believed that private and public sectors operated best with least interference. Attlee was a gifted man who gave his nation strong leadership at a time of economic change following the cost of the Second World War and the destruction of much industrial infrastructure. Attlee was born in Putney, London, into a middle-class family, the seventh of eight children. His father, Henry Attlee (1841–1908), was a solicitor, while his mother, Ellen Bravery Watson (1847–1920), was the daughter of Thomas Watson of London. He was educated at Northaw School, Haileybury, and University College, Oxford, training as a lawyer. He turned to socialism after working with slum children in the East End of London. He left the Fabian Society and joined the Independent Labour Party in 1908. Attlee became a lecturer at the London School of Economics in 1913, but promptly applied for a Commission in 1914, for World War I. During World War I, Attlee served in Gallipoli and Mesopotamia, where he was badly wounded at Siege of Kut. He recovered back in England, and was sent to France in 1918, to serve on the Western Front for the last few months of the war. By the end of World War I, he had reached the rank of major. After the war, he returned to teaching at the London School of Economics. Attlee met Violet Millar on a trip to Italy in 1921. Within a few weeks of their return, they became engaged and were married at Christ Church, Hampstead, on January 10, 1922. Theirs would be a devoted marriage until her death in 1964. Their four children were Janet Helen (b. 1923), Lady Felicity Ann (1925-2007), Martin Attlee, 2nd Earl Attlee (1925-1991), and Lady Alison Elizabeth (b. 1930). Attlee became involved in local politics in the immediate post-war period, becoming mayor of the London borough of Stepney in 1919. At the 1922 general election, Attlee became the Member of Parliament for the constituency of Limehouse in Stepney. He was Ramsay MacDonald's parliamentary private secretary for the brief 1922 parliament. His first taste of ministerial office came in 1924, when he served as Under-Secretary of State for War in the short-lived First Labour Government, led by MacDonald. In 1926, he actively supported the General Strike. In 1927, he reluctantly joined the multi-party Simon Commission, a Royal Commission set up to examine the possibility of granting self-rule to India. As a result of the time he needed to devote to the commission, he was not initially offered a ministerial post in the Second Labour Government. Ironically, though, his unsought service on the Commission was to equip Attlee (who was later to have to decide the future of India as Prime Minister) with a thorough exposure to India and many of its political leaders. In 1930, Labour MP Oswald Mosley left the party after its rejection of his proposals for solving the unemployment problem. Attlee was given Mosley's post of Chancellor of the Duchy of Lancaster. He was Postmaster General at the time of the 1931 crisis, during which most of the party's leaders lost their seats. Attlee was given the deputy leadership under George Lansbury in the aftermath of 1931. Like MacDonald and Lansbury (who was a committed pacifist), Attlee and most Labour MPs (in concert with the Liberal Party) opposed rearmament during the interwar period, a position criticized by Winston Churchill in his book, The Gathering Storm. However, after the rise of Adolf Hitler, Attlee and most of the Labour Party would come to oppose appeasement, especially after the pacifist Lansbury's resignation in 1935. Attlee was appointed as an interim leader until after the 1935 general election that year. In the post-election leadership contest Attlee was elected, beating out both Herbert Morrison and Arthur Greenwood, and remained leader of the party until 1955—to date, Labour's longest-serving party leader. Attlee remained opposition leader when war broke out in 1939. The disastrous Norwegian Campaign resulted in a vote of no confidence in the government, and it was clear that a coalition government was necessary. The crisis coincided with the Labour Party Conference. Even if Attlee had been prepared to serve under Chamberlain (in a "national emergency government"), he would not have been able to carry the party with him. Consequently, Labour and the Liberals entered a coalition government led by Winston Churchill. In the World War II coalition government, three interconnected committees ran the war. Churchill chaired the War Cabinet and the Defense Committee. Attlee was his regular deputy in these committees, and answered for the government in parliament, when Churchill was absent. Attlee chaired the third body, the Lord President's Committee, which ran the civil side of the war. As Churchill was most concerned with executing the war, the arrangement suited civil-minded Attlee. Only he and Churchill remained in the war cabinet throughout World War II. Attlee was Lord Privy Seal (1940–1942), Deputy Prime Minister (1942–1945), Secretary of State for Dominion Affairs (1942–1943), and Lord President of the Council (1943–1945). Throughout the conflict, Attlee would prove to be a loyal ally of Churchill, and supported the latter in his continuation of Britain's resistance after the French capitulation in 1940. The war set in motion profound social changes within Britain, and led to a popular desire for social reform. This mood was epitomized in the Beveridge Report. The report assumed that the maintenance of full employment would be the aim of postwar governments, and that this would provide the basis for the welfare state. All major parties were committed to this aim, but perhaps Attlee and Labour were seen by the electorate as the best candidates to follow through with their program. The landslide 1945 Election returned Labour to power and Attlee became prime minister. In domestic policy, the party had clear aims. Attlee's first Health Secretary, Aneurin Bevan, fought against the general disapproval of the medical establishment in creating the British National Health Service. Although there are often disputes about its organization and funding, British parties to this day must still voice their general support for the NHS in order to remain electable. Attlee's government was also responsible for the nationalization of basic industries, such as coal mining and the steel industry, and for the creation of the state-owned British Railways. Other reforms included the creation of a National Parks system. Nevertheless, the most significant problem remained the economy; the war effort had left Britain practically bankrupt. During the period of transition to a peacetime economy, the maintaining of strategic military commitments created an imbalance of trade, and the dollar gap. This was mitigated by an American loan negotiated by John Maynard Keynes and the (reluctant) devaluation of the pound in 1949, by Stafford Cripps. With hindsight, the economic recovery was relatively rapid, yet rationing and coal shortages would continue in the postwar years. Despite an ensuing corruption scandal, Attlee remained personally popular with the electorate. Relations with the Royal Family, on the other hand, were more strained. A letter from Queen Elizabeth (later the Queen Mother), dated May 17, 1947, showed "her decided lack of enthusiasm for the socialist government" and describes the British electorate as "poor people, so many half-educated and bemused" for electing Attlee over war hero Winston Churchill. That said, this was to be expected since, as Lord Wyatt argues, the Queen Mother was "the most right-wing member of the Royal Family." In foreign affairs, Attlee's cabinet was concerned with four issues: Postwar Europe, the onset of the cold war, the establishment of the United Nations, and decolonization. The first two were closely related, and Attlee was assisted in these matters by Ernest Bevin. 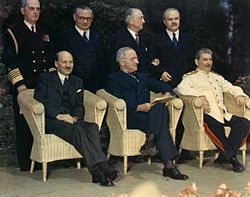 Attlee attended the later stages of the Potsdam Conference in the company of Truman and Stalin. In the immediate aftermath of the war, the government faced the challenge of managing relations with Britain's former war-time ally, Joseph Stalin and the Soviet Union. Attlee's Foreign Secretary, the former trade union leader Ernest Bevin, was passionately anti-communist, based largely on his experience of fighting communist influence in the trades union movement. Bevin's initial approach to the USSR as Foreign Secretary has been described by historian Kenneth O. Morgan as "wary and suspicious, but not automatically hostile." Attlee's cabinet was instrumental in promoting the American Marshall Plan for the economic recovery of Europe. In an early "good will" gesture much criticized later, the Attlee government allowed the Soviets access, under the terms of a 1946 UK-USSR Trade Agreement, to several Rolls-Royce Nene jet engines. The Soviets, who at the time were well behind the West in jet technology, reverse-engineered the Nene, and installed their own version in the MiG-15 interceptor, used to good effect against U.S.-UK forces in the subsequent Korean War, as well as in several later MiG models. After Stalin took political control of most of Eastern Europe and began to subvert other governments in the Balkans, Attlee's and Bevin's worst fears of Soviet intentions were borne out, and they became instrumental in the creation of the successful NATO defense alliance to protect Western Europe against any Soviet aggression. Attlee also shepherded Britain's successful development of a nuclear weapon, although the first successful test did not occur until 1952, after he left office. One of the most urgent problems concerned the future of the Palestine Mandate. This was a very unpopular commitment and the evacuation of British troops and subsequent handing over of the issue to the UN was widely supported by the public. Attlee's cabinet was responsible for the first and greatest act of decolonization in the British Empire—India. The partition of India soon created Pakistan, which then incorporated East Pakistan, now Bangladesh. The independence of Burma and Ceylon was also negotiated around this time. Some of the new countries became British Dominions, the genesis of the modern Commonwealth of Nations. His government's policies with regard to the other colonies, however, particularly those in Africa, were very different. These came under an unprecedented degree of direct control from London, as development schemes were implemented with a view to helping solve Britain's desperate post-war balance of payments crisis, and (perhaps secondarily) raising African living standards. This "new colonialism" was, however, generally a failure: In some cases, such as a then-infamous Ugandan groundnut scheme, spectacularly so. The Labour Party was returned to power in the United Kingdom general election, 1950, albeit with a much reduced majority in the first past the post voting system; it was at this time that a degree of Conservative opposition recovered at the expense of the dying Liberal Party. By 1951, the Attlee government was looking increasingly exhausted, with several of its most important ministers dead or dying. The party split in 1951, over the austerity budget brought in by Hugh Gaitskell to pay for the cost of Britain's participation in the Korean War: Aneurin Bevan, architect of the National Health Service (NHS), resigned to protest against the new charges for "teeth and spectacles" introduced by the budget, and was joined in this action by the later prime minister, Harold Wilson. Labour lost the United Kingdom general election, 1951, to Churchill's renewed Conservatives, despite polling more votes than in the 1945 election, and indeed more votes nationwide, than the Conservative Party. Attlee led the party in opposition until December 1955, when he retired from the Commons and was elevated to the peerage to take his seat in the House of Lords as Earl Attlee and Viscount Prestwood on December 16, 1955. He attended Churchill's funeral in January 1965, and died of pneumonia on October 8, 1967. The title then passed to his son Martin Richard Attlee, 2nd Earl Attlee (1927-1991). It is now held by Clement Attlee's grandson, John Richard Attlee, 3rd Earl Attlee. The third earl (a member of the Conservative Party) retained his seat in the Lords as one of the hereditary peers to remain under an amendment to Labour's 1999 House of Lords Act. When Attlee died, his estate was sworn for probate purposes at a value of £7,295, a relatively modest sum for so prominent a figure. "A modest man, but then he has so much to be modest about," is a quote about Attlee that is very commonly ascribed to Churchill (although Churchill in fact had every reason to respect Attlee's service in the War Cabinet). Attlee's modesty and quiet manner hid a great deal that has only come to light with historical reappraisal. In terms of the machinery of government, he was one of the most business like and effective of all the British prime ministers. Indeed, he is widely praised by his successors, both Labour and Conservative. His leadership style, of consensual government, acting as a chairman rather than a president, won him much praise from historians and politicians alike. Even Thatcherites confess to admiring him. Christopher Soames, a Cabinet Minister under Thatcher, remarked that "Mrs Thatcher was not really running a team. Every time you have a Prime Minister who wants to make all the decisions, it mainly leads to bad results. Attlee didn't. That's why he was so damn good." Even Thatcher herself wrote in her 1995 memoirs, which charted her beginnings in Grantham to her victory in the 1979 General Election, that she admired Attlee, saying, "Of Clement Attlee, however, I was an admirer. He was a serious man and a patriot. Quite contrary to the general tendency of politicians in the 1990s, he was all substance and no show." His administration presided over the successful transition from a wartime economy to peacetime, tackling problems of demobilization, shortages of foreign currency, and adverse deficits in trade balances and government expenditure. Another change he brought about in domestic politics was the establishment of the National Health Service and post-war Welfare State. 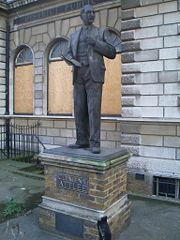 Statue of Attlee outside Limehouse Library. In foreign affairs, he did much to assist with the post-war economic recovery of Europe, though this did not lead to a realization that this was where Britain's future might lie. He proved a loyal ally of America at the onset of the cold war. Because of his style of leadership, it was not he but Ernest Bevin who masterminded foreign policy, a man of whom A. J. P. Taylor said: "He objected to ideas only when others had them." Though a socialist, Attlee still believed in the British Empire of his youth, an institution that, on the whole, he thought was a power for good in the world. Nevertheless, he saw that a large part of it needed to be self-governing. Using the Dominions of Canada, Australia, and New Zealand as a model, he began the transformation of the Empire into the Commonwealth. His greatest achievement, surpassing many of these, was, perhaps, the establishment of a political and economic consensus about the governance of Britain that all parties subscribed to for three decades, fixing the arena of political discourse until the later 1970s. ↑ Stuart Ball, A Brief History of the Conservative Party. Retrieved June 15, 2007. ↑ Ipsos Mori, Rating British Prime Ministers. Retrieved June 13, 2007. ↑ Eric Grove, The Norway Campaign in World War II. Retrieved June 16, 2007. ↑ Robert J. Blendon and Karen Donelan, British Public opinion of National Health Service Reform. Retrieved June 13, 2007. ↑ Andrew Pierce, What Queen Mother really thought of Attlee's socialistic "heaven on earth." Retrieved June 13, 2007. ↑ Walter L. Arnstein, Britain Yesterday and Today: 1830 to the Present (Boston: Heath, 1966). ↑ A.J.P Taylor, A.J.P. Taylor. Retrieved June 16, 2007. Attlee, Clement. As it Happened. New York: Viking Press, 1954. —. The Social Worker. London: G. Bell, 1920. —. The Town Councillor. London: Labour Pub. Co., 1925. —. The Will and the Way to Socialism. London: Methuen, 1935. —. The Labour Party in Perspective. London: V. Gollancz, 1937. —. Collective Security Under the United Nations. London: David Davies Memorial Institute of International Studies, 1958. —. Empire into Commonwealth. New York: Oxford University Press, 1961. Jenkins, Roy. Mr Attlee. London: Heinemann, 1948. Clement Attlee Number 10 Downing Street, The official site of the British Prime Minister's Office. This page was last modified on 3 March 2017, at 17:45.